Do you remember the 90's when everyone was crazy about friendship bracelets? I used to make all kinds of friendship bracelets when I was a kid. The results where great but I remember enjoying the process the most. Precisely following a pattern, making all knots neat and tight, and bringing up the patience to stay with it until it's done. Yeah! But friendship bracelets aren't only for school kids. 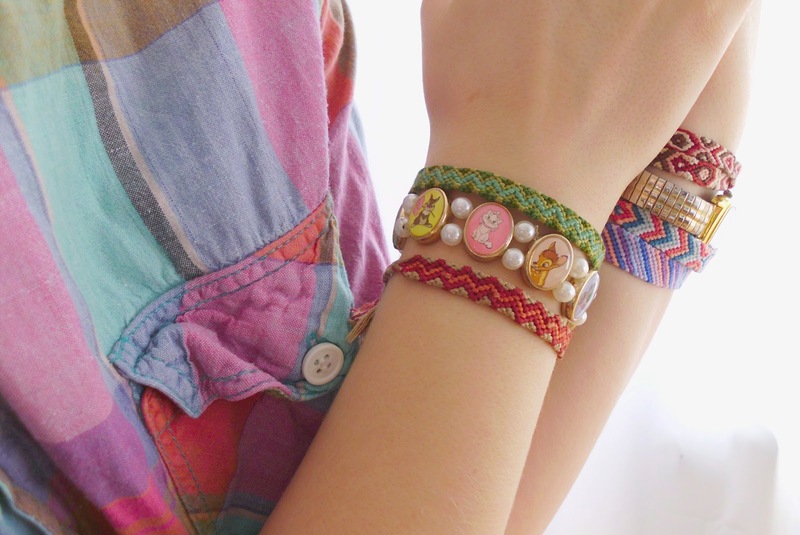 These colorful bracelets are cute and really bring you in the mood for spring and summer! I like to wear a few of them at once or combine them with some "metal" bracelets. You can even make one for every outfit you have! For those of you who never made a friendship bracelet we'll start with the easiest pattern one could think of. You only have to know how to do a backward knot. Easy peasy. And the result is quite nice! So let's jump right in and start knotting! You start with two strings next to each other. The left string should be held tight all the time while you work with the other string (the working string). With the right string form a loop over and around the left string. Pull the string through the loop from behind. Now hold the left string tight and pull the working string to the left. It is easier if you use your left hand for that. You now have something that looks like a tiny knot, but that's only the half of it. Repeat steps 2 and 3. Afterwards, there's a knot in the color of the string you worked with and the working string moved to the left. Material: Embroidery thread in different colors (I recommend this . Every color you can think of in one box! ), Scissors. Choose the colors you would like to have in your bracelet. This could be up to 10 different colors, as you have to have 10 strings of embroidery thread. But you can also choose only two. Or five. or eight. Then choose an ordering and place the threads next to each other. The colors will appear from right to left. When you have an ordering, tie a knot at about 5 inches from the top. 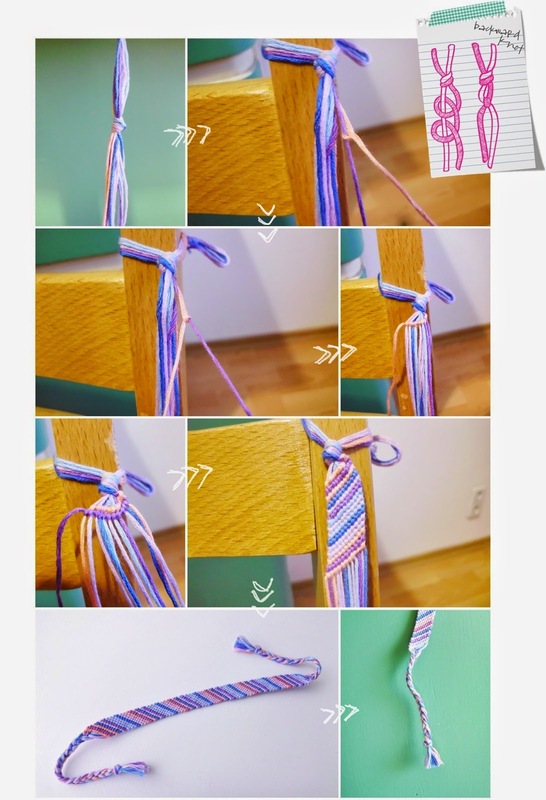 Tie the short end to a chair or a table or to anything that will resist some pulling. Reorder the strings. Take the first two threads from the right and make a backward knot like described above. You will have a knot in the color of the outermost string (which is now second from right). Take the next two strings (number 2 and 3 from the right) and make a backward knot which then should have the same color as the knot before. Repeat for all 10 strings and you have your first stripe. It probably looks not straight at all but that's normal. Just continue! Start from the right again and repeat steps 1 and 2, resulting in a second stripe. Repeat steps 1 and 2 until your bracelet reaches the desired length. Untie the knot at the top of the bracelet, braid both ends and tie a knot at the ends. That's it! Pretty easy, huh? You can do it, let's go! I'm planning a second post about friendship bracelets with a bracelet that is a little harder, so please practice this one while you wait and you will be well prepared! Edit: I got quite a lot questions about that Disney bracelet on the very first picture. So for anyone who's interested in that: I bought that bracelet quite some time ago at the H&M children's department (It's a little tight around my wrist but I love it anyways!). Please post a tutorial on how to make that gorgeous beige/red/orange zig-zag one! I love it!! Thanks so much for this tutorial it's really well written :) Keep up the good work! 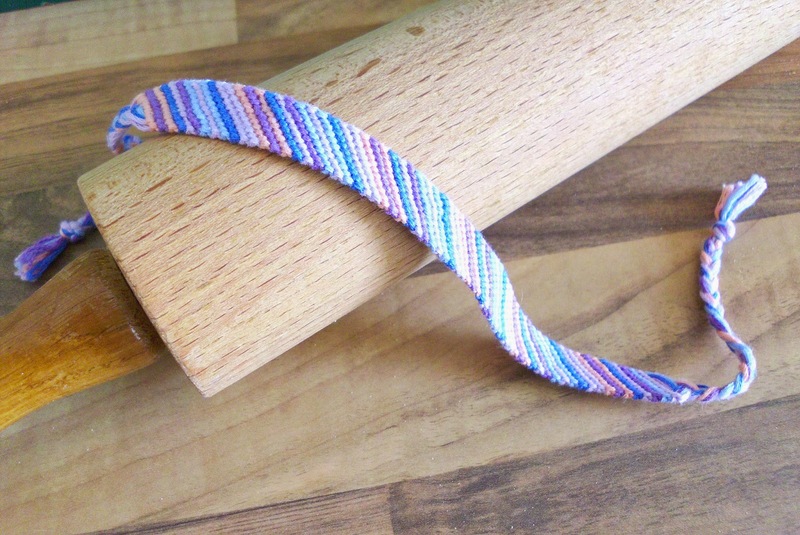 Pleaseee post a tutorial on how to make the bracelet that is like zig-zag ! sooo coool !